You know that feeling just as something bad is happening that you can’t control, when your stomach does a backflip, lurches up into your throat, and then drops into your toes? I experienced it one day snapping back to full consciousness as my car glided off the left shoulder of the freeway and spun in a full 360-degree circle on the gravel. I’d logged a very busy week at work, been to a music group practice, done some freelance editing, and gone for a few runs in preparation for a marathon. Now I was headed to a weekend event with my spiritual community. There I was, zipping down the freeway in the fast lane on a crisp and sunny fall morning. I felt drowsy, so I flipped on the car radio to keep myself alert. In retrospect, I should have also sung along at the top of my lungs. Or, you know, pulled off the road to rest. But I didn’t want to be late for the start of the gathering. Ever been so exhausted you can’t think straight? And it’s not just unhealthy. It’s downright dangerous. Excessive fatigue is epidemic in our society. According to a 2011 National Sleep Foundation poll, close to half of Americans between thirteen and sixty-four say they rarely or never get a good night’s sleep during the work week. Exhaustion can lead to all sorts of problems, from impaired performance, poor immune system function, and increased risk of obesity to stroke, diabetes, and heart disease. Not to mention car accidents. The first step in avoiding exhaustion—as with most problems—is self-awareness. You need to check in with yourself regularly to see if you’re overdoing it. The second step is figuring out what to do about it if you are. 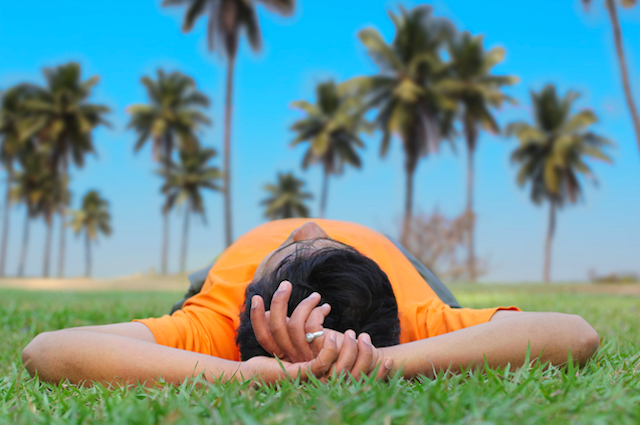 The standard advice is true: If you’re overtired, stop what you’re doing and rest or sleep. Draw firm boundaries around your time and energy by learning to say no to people, things—and sometimes yourself. Practice good sleep hygiene and try to get a full night’s sleep every night. But there are times when, despite our best intentions, we don’t—or can’t—do these things. What then? 1. Ditch the traditional nightly sleep cycle. If a straight eight hours doesn’t do it for you, consider this: some researchers suspect we’re not wired for it anyway. They say that prehistoric humans slept for about four hours, woke up for a while, and went back to sleep again until dawn. Others have noted different sleep patterns across cultures, from the midday siesta to countries where multiple naps are the norm. Experiment and see if changing up your sleep periods makes a difference. 2. Do the opposite of whatever you’ve been doing. If you’ve been pushing yourself physically, it’s no surprise that you should stop and rest or take a nap, or go to bed early. But if you’ve been pushing yourself mentally, go do something physical. Take a walk, do some stretching, or run an errand. Bodily movement will clear your head, get your blood flowing, and help bring you back into balance. 3. Hit that snooze alarm without guilt. I’ve used a trick to psych myself out for years. I work backward from the time I want to wake up, factor in two snooze alarm periods, and set my clock for that earlier time. 4. Pretend you’ve just woken up. Another mental trick—as you’re going to bed at night, tell yourself it’s morning. Imagine what it would feel like to go through an entire day, starting right now. Think about all that physical and mental effort. You can even do (just a few!) jumping jacks or deep stretches to give your muscles a brief sense of fatigue. How many times have you said to yourself, “I just wish I could go back to sleep for another eight hours”? Now go “back” to sleep for another eight hours. You’d think this tip wouldn’t qualify as “surprising,” yet sadly, for many of us, it does. When you suffer from Superhero Syndrome, you’re usually under the impression that everything on your to-do list has to be done by you. Granted, you may not be in the position to hire a personal staff to assist you. But that doesn’t mean you can’t ask for some help when you need it. As a fellow Superhero Syndrome sufferer, I know this is scary. But experience has shown me that when people value and care about you, they’re usually very happy to help. They won’t see you as weak or needy, but as someone who is strong enough to advocate for your own needs. Asking your spouse or partner to handle the kids for a while so you can take a break does not mean you don’t love your kids. It means you love them enough to want to give them your best, fully rested self. Requesting backup at work does not mean you’ll be seen as incompetent. It means you care about producing the best results possible, and that you’re secure enough to let others assist you with that. So go ahead and ask for support. You may very well be surprised by the result. Before bed, take five minutes to think about the next day and make some notes for yourself. For small tasks like calling the doctor, getting gas for the car, or picking up ingredients for dinner, writing them down or entering them into whatever device you use to track things reassures your mind, and you’ll be able to release them for the night. For longer-range projects, choose one small thing you can do to move them forward tomorrow. The idea here is that by making note of something in a place you know you’ll see it frees up your mind to relax into truly restful sleep. The most enduring result of that day has been that I now realize when I’m too tired to be safe or effective. On good days, I notice sooner and take steps to reverse the trend. If you’re suffering from Superhero Syndrome and trying to do too much, don’t push yourself to (or worse, past) the point of exhaustion. You may not be as lucky as I was. Also, just plain old “being happier and more rested” is nice, too. Michelle Russell does her best to take off her superhero cape before she gets too tired from leaping tall buildings in a single bound. She also blogs at Enoughist.com, where one of the topics is how to know when you’ve done enough.